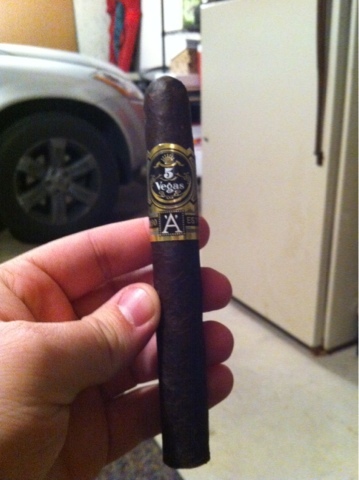 Appearance (0-20): When I took my first look at the 5 Vegas ‘A’ series, I could hear it screaming out to me… “Hey there big boy... Take a look at my delicious sultry Costa Rican maduro wrapper. Don’t I look nice all oiled up for you? Wouldn’t you like to give me a try? One taste and you’ll be hooked, Papi.” I wasn’t exactly sure why she called me Papi, but hey whatever. She looked really good with that black and gold garner holding up that cedar stocking, I was ready to do anything for this girl. (And you know we all do stupid things for beautiful women.) So I picked one up. Turns out from time to time listening to the beautiful girl actually pays off. This one is a gorgeous rich wrapper that was lined in cedar. The small veins in it were hardly noticeable. Near perfection for me. Construction (0-20): For a big meaty cigar, in the 6”x58 range, I was surprised at how it felt. Extremely firm to grasp with nearly the perfect draw. No burn problems, but I did seem to have some problems with the ash not wanting to hang around for more than about ¾ of an inch. I will mention, however, that upon the cut it cracked a bit. It was perfectly seasoned and everything (right humidity, perfect feel to it), but the wrapper on these tends to be a little stiffer than normal. Strength (0-20): When I puffed this one in I knew why she called me Papi. I was destined to go, “Damn Mamacita!”. This is another that’s a full bodied cigar, just as you would expect it to me. Each layer of flavor is hard and heavy. No drops in strength, just some interchanges in flavor. Flavor (0-20): Some delicious tastes will be pushed out to you by this succulent stick. Rich chocolate (not sweet, but more like a bakers chocolate) and coffee are complimented by spicy pepper tones. By the end the spice will have remained, but in a smaller quantity and will be replaced by something I can only describe as roasted peanuts. Value (0-20): Okay. Call me shocked. When a beautiful woman comes around you typically end up emptying your pockets before you can even figure out what happened. This one doesn’t make you do that. It’s a lower priced smoke for the size. So value proposition – high. Actual cost to you – low. Additional Notes: Paired with Dogfish Head Chicory Stout. This particular cigar has been aging in my humidor for over 4 years. Overall (0-100): It’s full bodied, rich, and has a medium complexity. Some of the flavor tones don’t transition perfectly, but it I something that’s quickly overlooked due to the power behind the cigar. Slight letdown with the construction, but with such a small price associated with it, I get the feeling that this beauty is going to become a mistress of mine.